KIEV, Ukraine -- About 1,000 Ukrainian pro-government fighters and far-right supporters have marched through the centre of the capital, Kiev. The protesters called on the government to declare war formally on the rebels in eastern Ukraine. 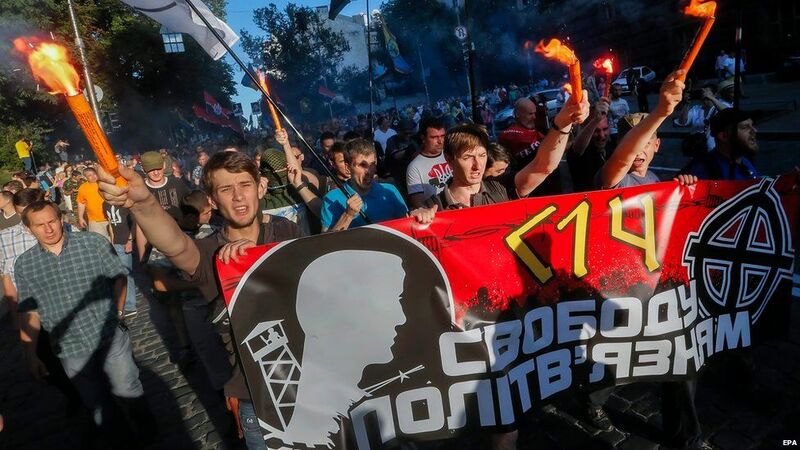 The ultra-nationalist Right Sector group called the march. Protesters also demanded the nationalisation of Russian-owned businesses. More than 6,600 people have been killed in fighting in eastern Ukraine that began in April 2014 when rebels seized large parts of the two eastern regions. This followed Russia's annexation of the Crimea peninsula. The BBC's David Stern in Kiev says Friday's rally was a show of strength in the heart of Ukrainian officialdom. But above all, our correspondent says, the demonstrators were calling for change. Both in the way that the conflict is being fought in the east and in the way that the country is being run. Central to their demands is an end to the Minsk ceasefire agreement signed in February which they say is a charade because of Russia's activities in Ukraine. The Ukrainian government, Western leaders and NATO all say there is clear evidence that Russia is helping the rebels in the Donetsk and Luhansk regions with heavy weapons and soldiers. Fierce fighting took place in June outside the rebel-held city of Donetsk, with Ukraine accusing the rebels of launching a full-scale offensive in violation of a truce. The separatists denied this and accused Ukrainian troops stationed nearby of repeatedly shelling the city - a claim in turn denied by the Ukrainian military. Everyone knows that the Minsk Agreement has been breached multiple times - almost entirely at the instigation of the Russian side. There is only one solution to the conflict....and that is the return of Ukrainian control over the Russo-Ukrainian border in the area; the prosecution of the criminal elements that have caused such widespread destruction and suffering; and the conduct of elections and decentralization in accordance with Ukrainian law and constitution. Anything less would be a reward to Russia and to the local criminal elements for the massive harm they have perpetrated on innocent Ukrainian civilians. However, the charade of a Minsk Agreement should be maintained long enough until Ukraine has fully prepared itself to stand up to Russia. The "rally" in Kyiv fails to take this into consideration. Ukraine, only a year ago, barely had an army. If it had not been for the incredible bravery of many of the participants in the rally who had risked their lives as "volunteers" to plug the leakage in Donbass, the Russians would have made far greater progress with their "Novorossiya" fantasy. Historians will view the Minsk Agreement as a stroke of good luck or of brilliant diplomacy in that it allowed the Ukrainian side to build up its defenses for the next, and more serious, round of confrontation.